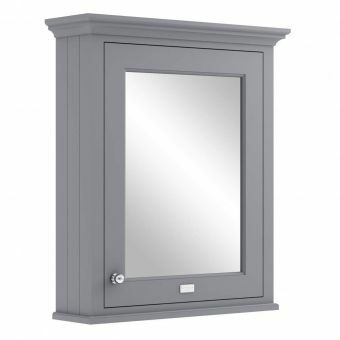 Free DeliveryKeuco Royal L1 Double Door Mirror CabinetFrom £816.67 inc.VATRRP: £1166.68 (Save 30%)Fully mirrored inside and out, 650 or 800mm wide with lighting and internal shaver socket. 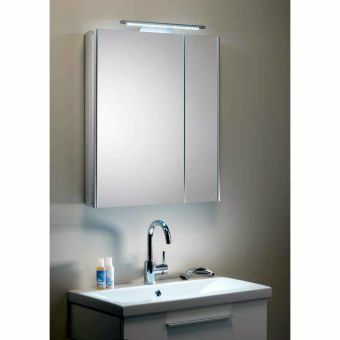 Free DeliveryKeuco Royal Reflex Mirror CabinetFrom £586.09 inc.VATRRP: £837.28 (Save 30%)5 sizes: 500, 650, 800, 1000 and 1300mm with lighting. Features fluorescent lighting & shaver socket. 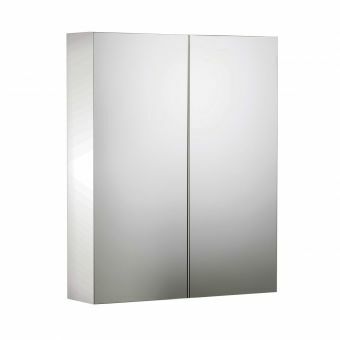 Free DeliveryKeuco Royal 15 Double Door Mirror CabinetFrom £740.40 inc.VATRRP: £1057.72 (Save 30%)3 widths of 650, 800 and 1000mm. 3 direction lighting, 720mm tall. 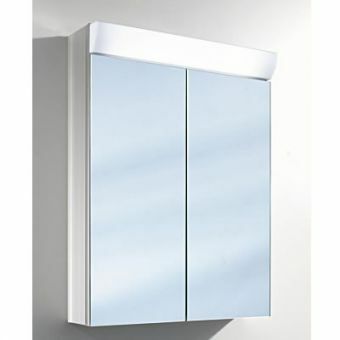 Keuco Royal Match Semi Recessed Mirror CabinetsFrom £787.44 inc.VATRRP: £1124.92 (Save 30%)Tidy recessed storage, slimline sleek looking. Shallow installation depth of only 82mm - in 5 sizes! Free DeliveryAbacus Pure Double Door Mirror Cabinet 80£419.30 inc.VATRRP: £599.00 (Save 30%)800mm wide with double mirrored doors, with lighting. 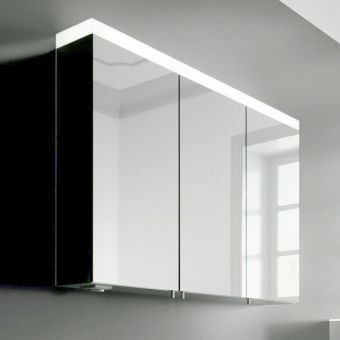 Slimline design with mirrors inside and out! 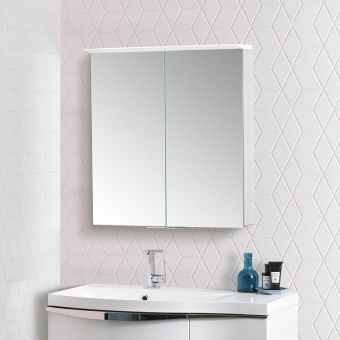 Free DeliveryKeuco Royal 15 Single Door Mirror CabinetFrom £532.33 inc.VATRRP: £760.48 (Save 30%)Single door, left or right-hand options! 500 wide, 720mm tall. The best-looking bathrooms are sleek and clutter free, but to achieve that showroom look you need somewhere to store everything. Whether it's his shaving kit, three different kinds of mouthwash or maybe the family first aid kit. 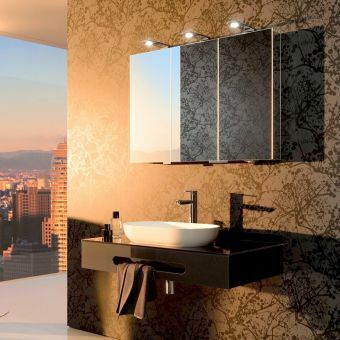 At UK Bathrooms we offer an amazing range of high quality bathroom cabinets designed to fit your lifestyle. Whether you're looking for the most modern sleek aluminum cabinets with built in lighting and mirrored doors, or something a whole lot more traditional in wood, we'll have something for you. 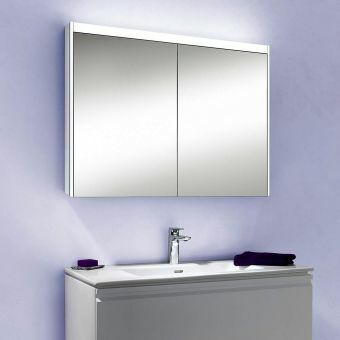 Our bathroom cabinets all come to you at huge price savings compared to the high street. They are priced from the simple Roper Rhodes Lockable Medicab at just £300 saving on the high street price! 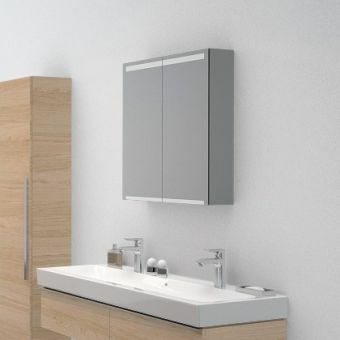 If a standard bathroom cabinet over the sink still isn't big enough to hold the family's bathroom essentials then have a look at the tall cabinets such as the Bauhaus Tower unit, it's a considerable meter and a half high, but it's not just about size, it also matches other items in the simple and elegant Bauhaus range. We know you want your bathroom to look clean, sleek and clutter free, but with so many beauty essentials that look can be a hard one to achieve. 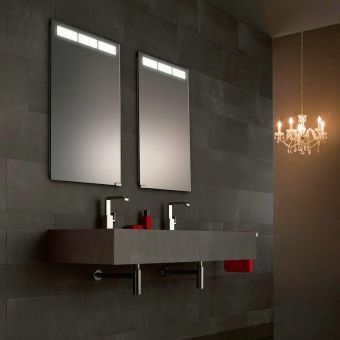 That’s why we stock a wide range of bathroom cabinets, helping make the minimal bathroom a reality for you. Whatever it is you want to hide away – mouthwash isn’t the best to look at, is it? – we’ve got the perfect storage solution for you. 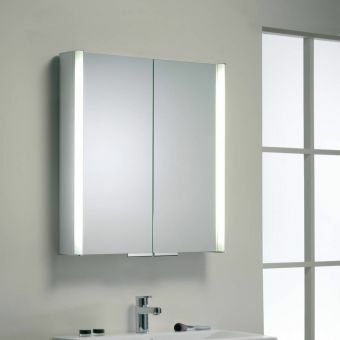 Whether you’re looking for a sleek, mirrored finish with ambient lighting, or a wooden cabinet, we’ve got it covered. 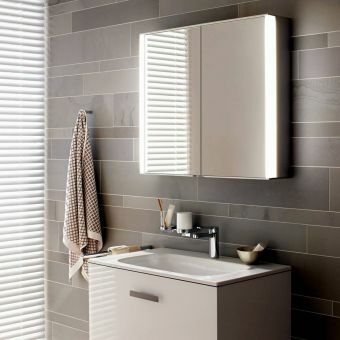 Not just that, at UK Bathrooms we represent excellent value for money, offering huge cost savings on high street bathroom retailers, with savings of over £300 on some cabinets. We’re not ones to be beaten on price or style. 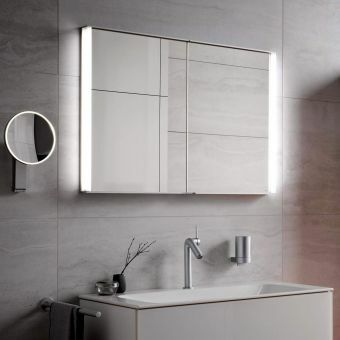 With smoothly rounded sides and a fully mirrored door, the Roper Rhodes Definition Phase blends design with functionality to create a stunning cabinet, equally at home in the traditional or contemporary bathroom. 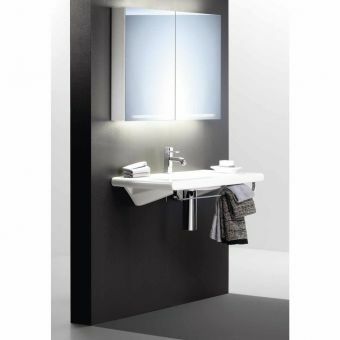 Optional overhead LED lights create perfect lighting for make up application or shaving, and also add a flattering glow to the washing area. 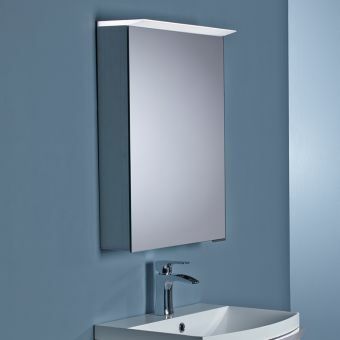 The optional LED unit features no touch infrared technology and an optional shaving unit, adding to its practicality. All electronics are fully enclosed for maximum safety. With soft close technology, the cabinet won’t slam or make a noise; this, combined with 6mm laminated safety glass, means the Definition Phase is as practical as it is beautiful. 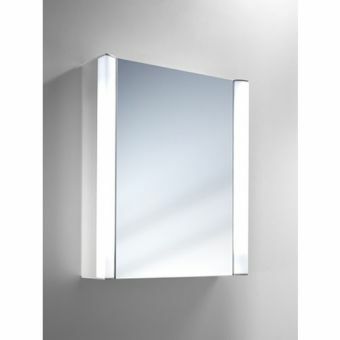 Additionally the mirror is double sided, adding to its functionality. With two adjustable shelves, the Definition Phase has plenty of storage space so all your bits and pieces can be cleared away. 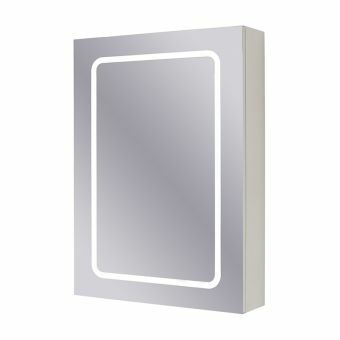 Finished in white, it’s the perfect addition to the minimal bathroom. Please note, cabinets with additional electronics aren’t suitable for use in zones 1 and 2. 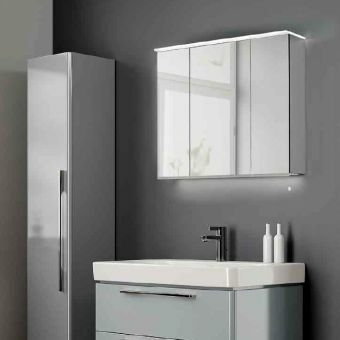 The Ascension Elevate single door cabinet is a simple, yet eye catching, cabinet with clean angles and straight lines, making it suited to the contemporary bathroom. The Elevate is lit by a single cylindrical fluorescent tube – you have the option to chose lighting to the top – as pictured – or to the side, in both the single and double doored cabinet. 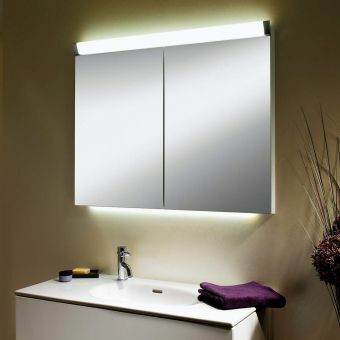 The lighting strip features no touch infrared on/off technology, and an integrated shaver unit, adding to its practicality. 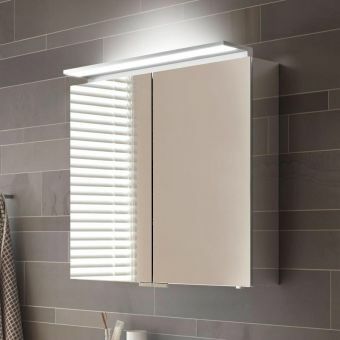 When lit from above, the insides of the cabinet are fully lit when open, a practical design feature minimising the need for additional lighting in the wash area. 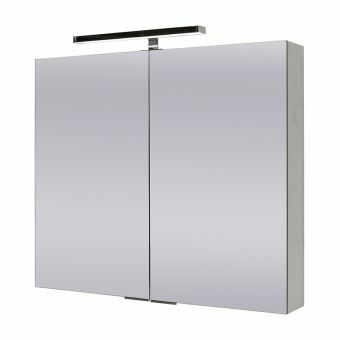 Designed to last and manufactured from hard wearing aluminium, the cabinet features a double sided mirror on its soft close doors, and both the interior shelves are fully adjustable, for user comfort. Please note that cabinets using infrared technology must be mounted a minimum of 150mm from the adjacent wall for allow the sensor to function correctly. Keuco are one of Europe's leading cabinet manufacturers, and the Royal 30 Cabinet combines all their design experience with practical expertise to create a stunning addition to your home. 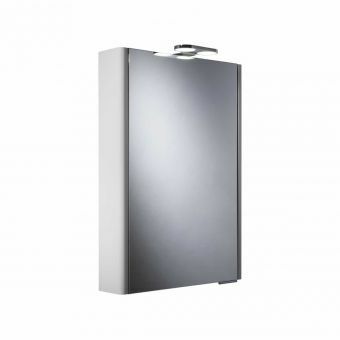 A simple, sleek fully mirrored double doored cabinet, the Keuco Royal 30 mirror cabinet is the perfect addition to the contemporary bathroom. 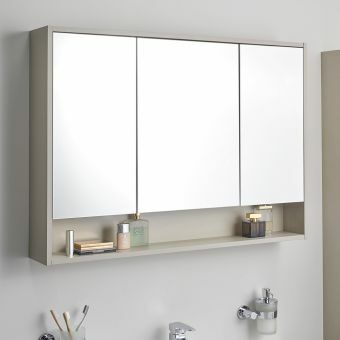 The fully mirrored exterior opens to reveal six adjustable interior shelves, perfect for all your storage needs and ensuring you too can achieve the perfectly minimal bathroom. 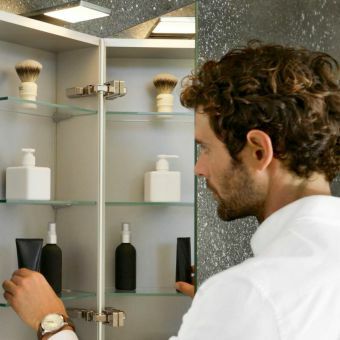 An integrated shaver is built into the cabinet, adding to its functionality. 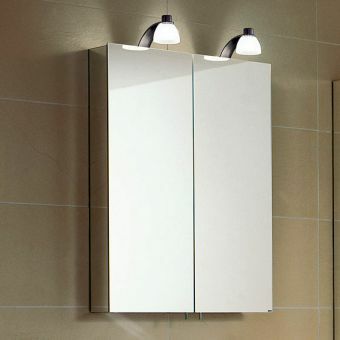 Both doors are double sided mirrors, allowing you to get the maximum usage from them. The Royal 30 come with the optional extra of two overhead halogen lights, adding to its appeal, combining practical illumination with additional design features when you consider the lamps are encased in softly curving shades. 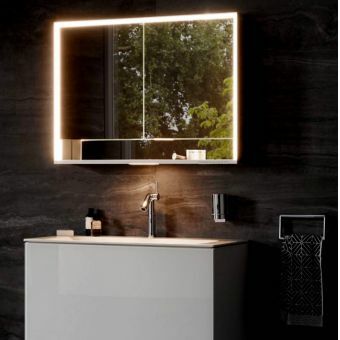 The Keuco Royal Universe illuminated mirror cabinet is a stunning piece of bathroom hardware; with clean, simple lines and sharp angles it’s the perfect addition to a minimalist bathroom interior. With a choice of one, two, three or four doors, the Universe has all your storage bases covered. 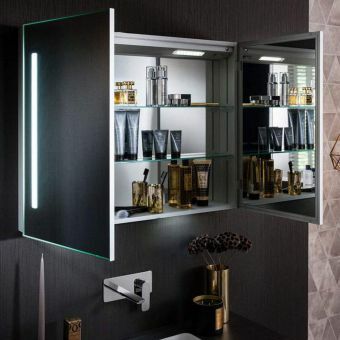 Fitted with overhead lights adding to both its practicality and design features, this cubist-inspired cabinet is perfect for the design-conscious, cosmopolitan consumer. 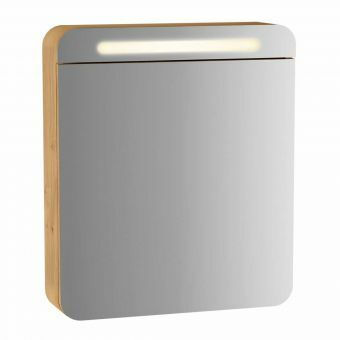 Opened with a sleek, discreet bottom handle, and lit with a flick of the external switch, the Royal Universe has low running costs and a small environmental footprint due to its low energy consumption LEDS – perfect not just for your bathroom but also your wallet. 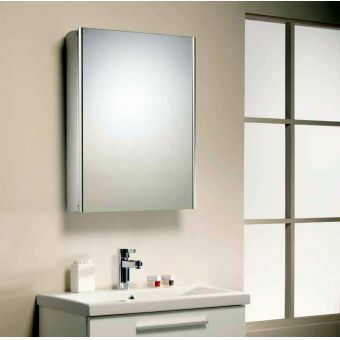 With an integrated shaver unit, the Universe seamlessly combines elegance with full functionality. 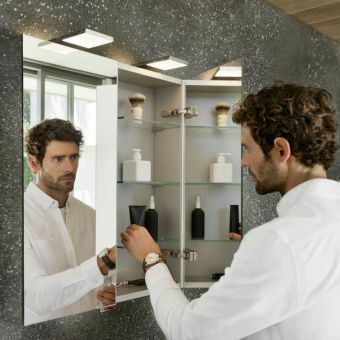 Mirrored both internally and externally, with three to six fully adjustable internal shelves, depending on size, the Universe is perfect for storing all your essentials and providing lighting to a much used area of your home. The Universe is rated IP X4 for safe use in zones 2 and 3. 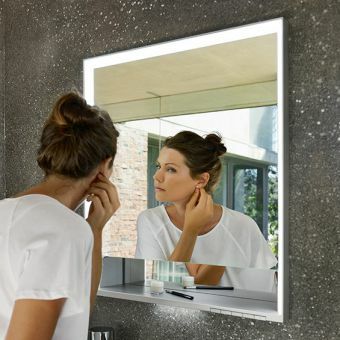 With a reputation for excellent quality and design, Schneider bring you the Prideline; featuring simple, clean lines this is a stylish and practical addition to your wash area. Made from anodised aluminium, it is both hard wearing and lightweight. With a cylindrical overhead fluorescent light, the Prideline combines practicality with design, resulting in a lovely cabinet that’s ideal for all your storage needs. 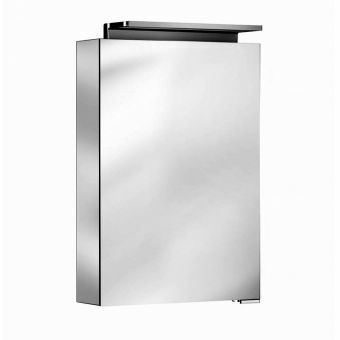 The mirrored door is adjustable for left and right hand opening, and fits flush with the cabinet, concealing an enclosed handle for smooth opening. Soft close doors allow for gentle closing, never detracting from desired bathroom ambience. With two adjustable storage shelves, an accessory box and a magnifying mirror, the Prideline ticks all the storage boxes! 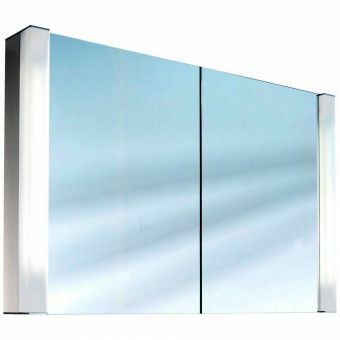 The Schneider Lowline 1 door mirror cabinet with fluorescent light combines all of Schneider’s characteristic design expertise with functionality, resulting in a cabinet that’s beautiful and practical. 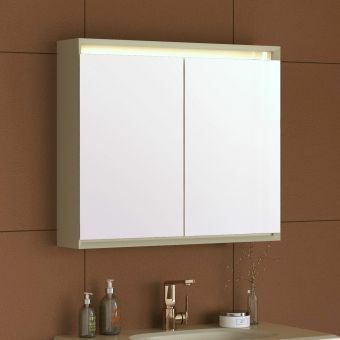 The Lowline is a simple and elegant cabinet top lit by a stunning, cubic fluorescent light. Externally the cabinet is all smooth, simple lines, complemented by the lighting strip, adding functional lighting to the wash area. Internally there are two adjustable glass shelves, allowing you to store all your bathroom essentials to create the desired minimalist space. 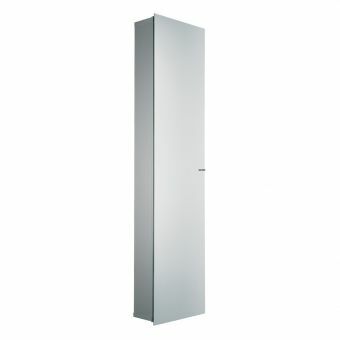 Soft close doors prevent damage to the cabinet unit. 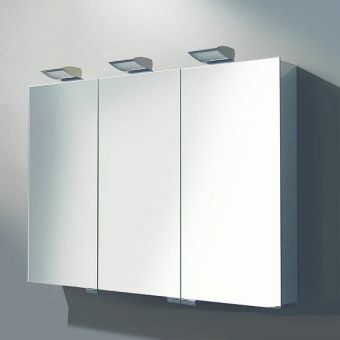 Available in the range of three sizes the Lowline is perfect for all and any of your bathroom storage needs.